Where would we be without trails? Not very far into the wilderness. That’s why Mountaineers Books designates 1 percent of the sales of select guidebooks in our Day Hiking series toward volunteer trail maintenance. Since launching this program, we’ve contributed more than $14,000 toward improving trails. Mountaineers Books donates many books to non-profit recreation and conservation organizations. 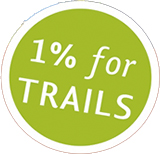 Our “1% for Trails” campaign is one more way we can help fellow non-profit organizations as we work together to get more people outside, to both enjoy and protect our wild public lands. Thank you for choosing our guidebook! Your purchase will help not only you, but also many other people, to experience wild places safely and with confidence, while pitching in on trail work, too. If you’d like to support Mountaineers Books and our non-profit partnership programs, please visit our website to learn more or email mbooks@mountaineersbooks.org.